Following the Four Things We Can Do To Make More Atheists post, I elaborated on the ideas of criticizing religious belief and promoting atheism. 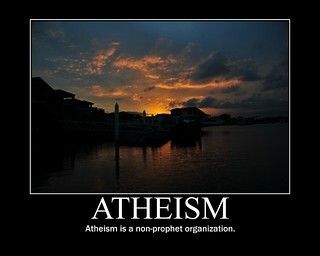 In this post, I'll expand on the idea of supporting other atheists. I think this may be the most obvious of the four things. At least, I hope it is. If we are going to ask people living in religiously oppressive environments to walk away from the religious beliefs their culture pushes and embrace atheism, we must be ready to provide support to those who do. I noted previously that we need to figure out how to provide tangible support (e.g., housing, financial assistance). I was thinking here primarily about teens who are kicked out of their family homes for disclosing their atheism. But this could also include adults who lose their jobs due to atheism or even those who lose a partner on whom they were financially dependent. Atheism remains a risky proposition for many, and it makes sense to give some thought to how we might provide this sort of support effectively. Providing tangible support almost requires us to do something we are not very good at doing: organizing and collaborating. Individuals can certainly donate time, money, and effort, but there are very few of us who can afford to provide much of this type of support on our own. One example of where individuals without a great deal of money can make a real difference is Reddit's AtheistHavens. I suspect there are others of which I am unaware. Still, I imagine that we may eventually want to put systems in place to facilitate the provision of tangible support on a larger scale. Most of the other forms of support are things we can provide without incurring significant expenses, making them more viable for individuals to consider. Informational support is often overlooked but can be important. Consider helping an atheist in need access and decipher complex but vital information (e.g., how to open one's first bank account, find someone who can legally marry them in a religion-free environment, file for divorce, complain about a church-state violation). The types of information we can provide and to which we can direct people in need are virtually unlimited. Put yourself in the shoes of a 16 year-old who has just been thrown out of her family home. She will need tangible support, but I imagine she may also need informational support. There are probably many things she does not know how to do because she's never needed to know. This sort of informational support is something we can all provide. When I think of emotional support in this context, I am including everything from having supportive peers one can talk to about what one is going through to mental health professionals who can provide support to persons struggling with psychological problems. We can all provide many forms of emotional support to religious believers who are struggling with doubt and to those who have recently recognized that they are atheists. Most of the time, what these people need is a supportive listener. They need someone they can talk to who will not judge them, condemn them to hell, or threaten to tell others what they have said. I really missed having this sort of support when I was struggling with doubt and first coming to terms with the possibility that I might be an atheist. I felt totally alone, and it was scary. I did not have anyone I could talk to about this stuff, and I have no question that this delayed my progress by a year or more. If I had only had one person I could have talked to - even if only by phone - it would have made a big difference. In some ways, social support is easier in the sense that it can mean little more than having the opportunity to interact with like-minded individuals. They don't even have to be like-minded as long as they aren't going to judge or condemn the struggling believer or recent atheist. In other ways, it is more difficult in that it can be challenging to recreate the sort of support network a formerly religious person might have experienced from a church community. In the atheist community, we don't have anything as all-encompassing as the evangelical mega-church in terms of meeting any social needs someone could have. I am not arguing that we need atheist churches of some sort, but I think we need to recognize that some recent atheists are going to miss many aspects of social support that were provided by their churches. It may be unrealistic to expect that we will recreate all of this, but I do think that we have to be better equipped to fill what can be an important void in the lives of many recent atheists. "Accept reality; choose atheism" is not going to be a terribly effective message if we have to tack on "and be all alone" at the end. If we are going to ask people to walk away from the religious institutions that have been providing social support, we cannot ignore the fact that many recent atheists are going to miss this aspect of their religions. At a minimum, we are going to need to make it easier for struggling religious believers and recent atheists to find communities of atheists. A couple of years ago, I had an eye-opening conversation with a young atheist here in Mississippi. She told me that she came out as an atheist toward the end of high school after realizing that she could no longer believe in the evangelical fundamentalist Christianity in which she had been raised. She went from popular and outgoing to being completely alone and withdrawn almost overnight. While her parents did not kick her out of their home, she lost all her friends. Her entire social life revolved around the church she had always attended. Without it, she had nobody. She had hoped to find support at the small public high school she attended, but once word of her atheism spread, she was shunned by the other students. Had she not been planning to leave her home town in a few months for college, she said that she probably would have killed herself. As long as atheism continues to carry the sort of social stigma it does today, our ability and willingness to provide support to those who are making the transition from religious belief to atheism will be important.